The STYLCAM 200 is a fully instrumented single punch rotary press simulator that allows scale up with maximum confidence, making it an ideal tool for industrial transposition. The STYLCAM 200 R simulator features high production capacity and weight regulation, allowing it to perform manufacturing of clinical batches as true prototypes of final production batches. The STYLCAM 200 WIP version is fitted with even higher containment, RTP port and Wash In Place spray equipment to allow operators to perform small-scale clinical research or production runs in perfect safety, even without gloves. 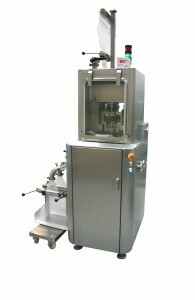 All STYLCAM 200 machines come as standard with vacuum removal of particles around punches and dies, ramp deduster, gravity feed shoe, funnel and manual single tablet feeder. The STYLCAM 200 machines come packaged as standard with ANALIS Advanced software, a very detailed data acquisition and analysis system that provides ultra-reliable predictive analysis at a very early stage in the development process. This ensures rapid performance of in-depth studies by adding full automation of research and reporting and ability to modify compression profiles to create optimised individual profiles. MEDELPHARM places at your disposable a fully equipped test laboratory which allows STYLCAM users to ‘test drive’ their machines and evaluate the ANALIS software. Maximum production cycle 3000 tabs/hr. Typical production simulation 300,000 tabs/hr. 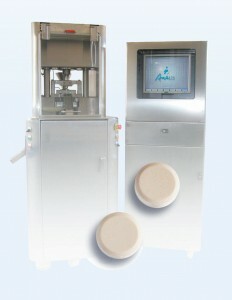 Click on STYLCAM200 Series – Rotary Press Simulator for further information.